Give your pal a holistic boost of nutrition with the Dr. Mercola Organic Mushroom Complex Dog & Cat Supplement. Formulated with a proprietary blend of 100% organic, USA-sourced mushrooms like reishi, lion’s mane, maitake and more, it provides nutrients, vitamins and minerals to support overall health. It’s high in alpha- and beta-glucans to support a healthy immune system, vegetarian glucosamine for supple joints, fiber and prebiotics for digestive health, plus antioxidants and a boost of protein. Plus, the formula is made with the whole mushroom and not extracts to keep all the good stuff in, with no fillers, additives, gluten or heavy metals. Supports overall health with proprietary blend of reishi, cordyceps, king trumpet, shiitake, turkey tail, himematsutake, maitake and lion’s mane mushrooms. With alpha- and beta-glucans and polyphenols including l-ergothioneine for a healthy immune system, plus antioxidants, vitamins and minerals. Contains naturally-occurring digestive enzymes, fiber and prebiotics for digestive health. Helps maintain healthy joints with vegetarian glucosamine and provides a healthy dose of vegetarian protein. Made with whole food mushroom instead of extracts for maximum potency, from 100% organic and USA-sourced mushrooms. For animal use only. Keep out of reach of children.In case of accidental overdose, contact a health professional immediately. Reishi (Ganoderma Lucidum) (200 mg) , Cordyceps (Cordyceps Militaris) (200 mg), King Trumpet (Pleurotus Eryngii) (200 mg), Shiitake (Lentinus Edodes) (100 mg), Turkey Tail (Trametes Versicolor) (100 mg), Himematsutake (Agaricus Blazei) (100 mg), Maitake (Grifola Frondosa) (50 mg), Lions Mane (Hericium Erinaceus) (50 mg). Saw improvement in 2 weeks!! Added to my 6 year old Bernese Mountain dog's anti-cancer protocol about 1 months ago. I spread it in his food once daily. He gobbles down his food. I firmly believe mushrooms have a healing effect. Look it up.Thanks Dr. Mercola!!!!! I purchased this for my dog who was recently diagnosed with a tumor in her chest. She was in very bad shape and we thought we were going to have to put her down. Fortunately she responded well to the meds from the vet and got her appetite back. She has been a little picky since she got sick but gobbles this supplement right up with her food every day. It is a very small scoop so I feel most dogs would be willing to eat it. This is one factor of our regimen to keep her healthy and so far so good! I definitely plan to keep her on it as long as we are lucky enough to have her with us! My Cat Does NOT like It!!! I do not usually give negative review but this one is not a product I would recommend. Dr. Mercola products are usually high quality, and I thought it will be a good addition to my cat's diet. He would NOT touch his food with this complex in it, even though it is mixed with his most favorite wet food. I don't know if it is the smell or something in it. It just does not appeal to my cat! I will not buy it again! After reading about this supplement, we are giving one of our dogs this to boost up his immune system. This also delivers digestive enzymes which helps him metabolize the nutrients from his diet. Haven't seen any result as of yet. Will give it more time. I've combined with Dr. Mercola's spirulina tablets and his probiotics. I did receive my order within 24 hours. That's impressive. Cats and Dog love this. 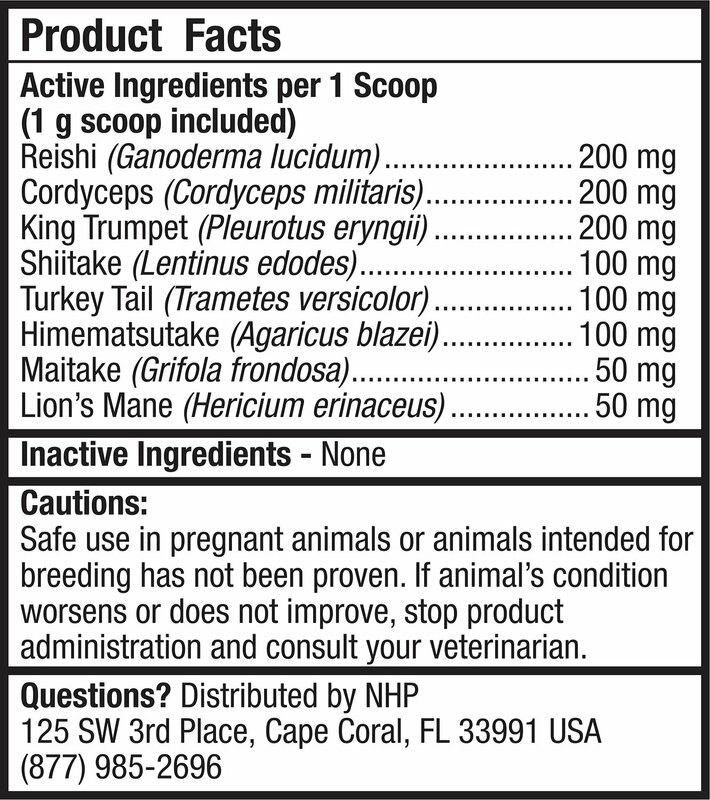 Dr. Becker recommends this supplement for healthy animals. All of my cats and my dog love having this mixed in with their food. I don't know yet what impact it is having on their health but I know it won't hurt them. I love that they are getting the benefit of mushrooms and it's very convenient for me. Organic is the way to go! This Organic Mushroom Complex is great for boosting the immune system of my Great Pyrenees naturally. I always try to go natural when possible. Thank you so much! Dr. Joel Fuhrman HIGHLY recommends mushrooms for the human immune system. 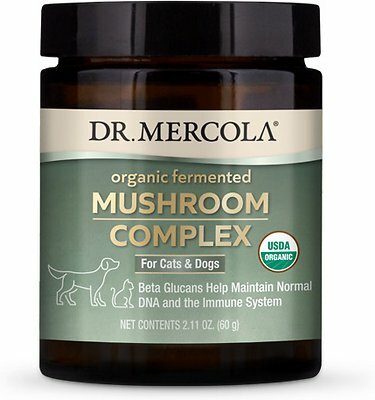 Finally this organic mushroom complex for pets. I am beyond thrilled to be able to get this at this price. I couldn't be happier. It has a pleasant earthy smell & mixed in with the food must only add to a pleasant wild taste. My kitty likes it or doesn't notice it. It may not cure everything, but I will continue to purchase & add to my kitty's food as long as Chewy has this. My only regret is not to have tried this sooner. Dr. Joel Fuhrman has something similar for people. I couldn't be happier to finally gotten this for my kitty & double thrilled about the price. This is for dogs & cats.